My favorite memories of food at home are not what you would expect. They’re not of the feast my mother spent all day in the kitchen preparing to commemorate a special occasion. They’re unplanned and utterly simple. 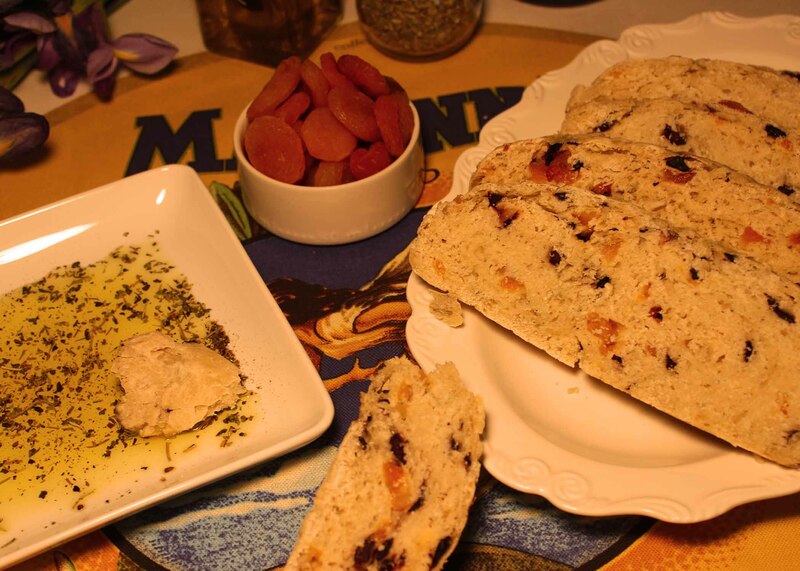 A spread of olives, cheese, freshly baked bread and olive oil for dipping was all it took to magically pull everyone in the house to the kitchen table. This made these simple “meals” my favorite. This olive, apricot & rosemary bread not only spread an intoxicating smell throughout my house, it ended up being the simplest and most delicious bread I’ve EVER* made! I devoured it just as I should–with good company, good conversation and copious amounts of olive oil. *Ok, so I haven’t exactly made bread from scratch that many times in my life, but this one is still by far the best! Sift flour in a large bowl. Add salt, yeast and mix well. Slowly add the warm water mixing as you go with a wooden spoon. The dough should be well mixed and sticky. Cover bowl with plastic wrap and place in a warm (but not turned on) oven for 3-6 hours. You’ll know it’s ready when the dough has approximately doubled in size. I took a before picture with my phone to compare with after 3 hours and it only took about 3 1/2 hours until mine looked ready. Remove bowl from the oven and turn the the temperature to 400 degrees Fahrenheit. Place your dutch oven* with the lid on inside. 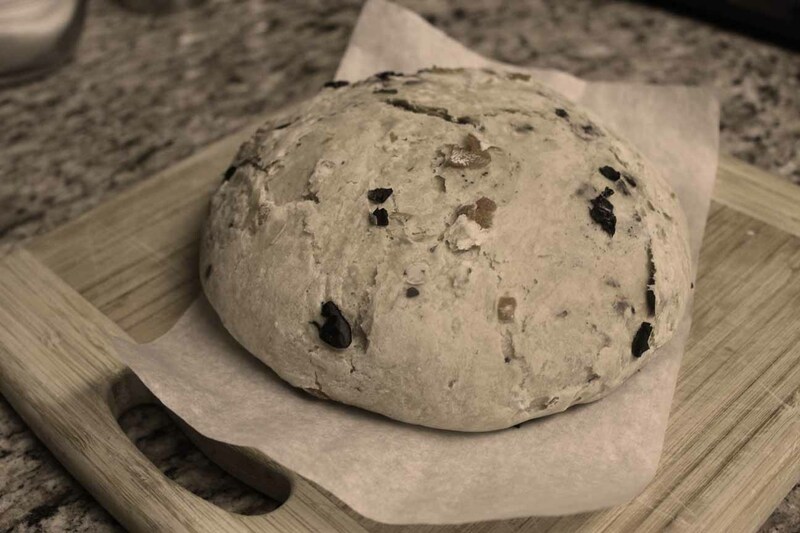 In the meantime, add the olives, apricot and rosemary to the dough and mix in well using your hands. 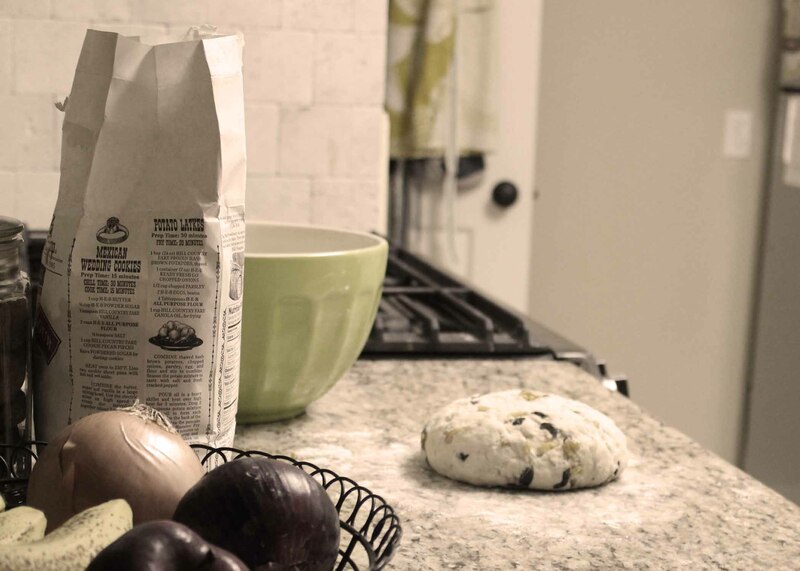 Place your dough on a clean surface dusted with flour and form it into a round shape. Then, cover it with plastic wrap and let it sit for 30 minutes while your oven finishes heating up. Once 30 minutes have passed, remove the pot from the oven and place the dough in it. Sprinkle the top of the dough with a pinch of additional salt. Place the lid back on the pot and bake the bread for 30 minutes. Then, remove the lid and bake for an additional 15 minutes to brown the top of the loaf. Is it ready? Tap on your loaf and you should hear a hollow sound. Typically, you’re supposed to allow the bread to cool completely before cutting and eating, but let’s face it–I’ll never do that. *If you don’t have a dutch oven, do yourself a favor and get one. I’ve had mine for a few months and it is the most versatile item in my kitchen. Mine is a classic Le Creuset-(best birthday gift ever)-but there are quite a few other, less expensive options out there.